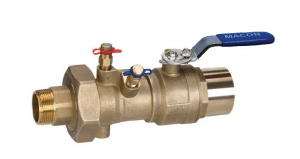 Model MB is a venturi style manual balancing valve with 100% positive shut-off full port plated ball. Permanently installed venturi section, Teflon seats, double o-ring shaft seals, Pressure/Temperature readout ports, adjustable memory stop with position indicator and union end with o-ring seal. Available with multiple combinations of end connection types and sizes. Ball: Chrome Plated Brass. Optional 316 Stainless Steel. Stainless Steel Ball & Stem.